It was such a treat to have Monday off, and I made the day even sweeter by whipping up some yummy pina coladas for a few friends. 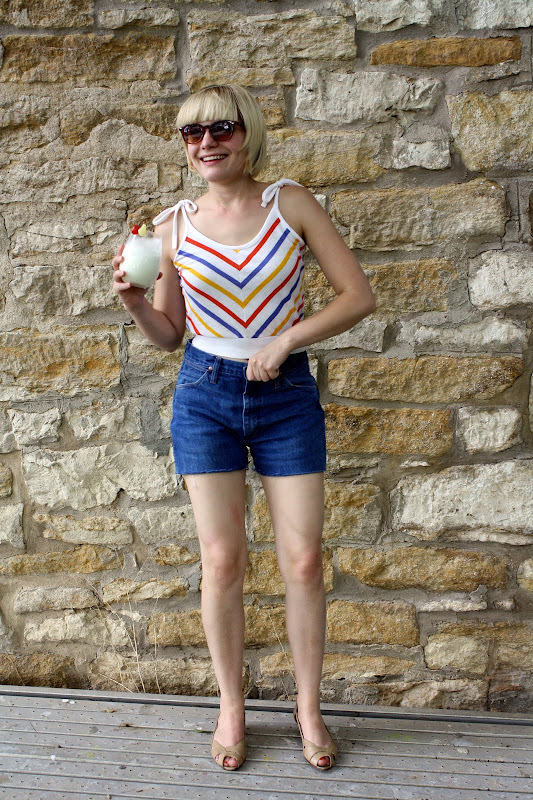 I'm generally not a fan of super sweet drinks, but I learned just how good this pineapple and coconut concoction could be when I went to Mexico in March. Whenever I wear these shorts, I think they look fine until I see them in pictures. 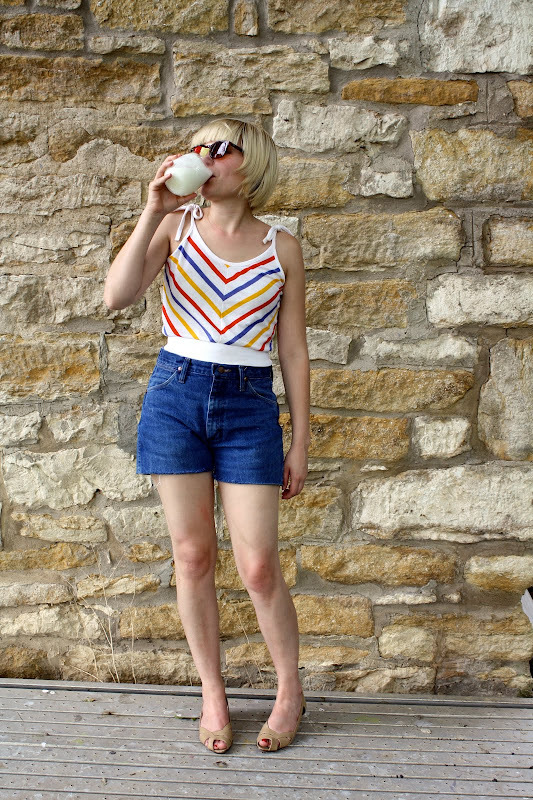 The search for a perfect pair of denim cut-offs will continue, but on Monday it didn't matter. I hadn't a care in the world, and frumpy shorts were not going to get me down. After this weekend, it officially feels like summer, and I couldn't be happier. Bring on the breezy dresses, backyard parties, cold cocktails and days at the lake! Did you have a long weekend? Do anything fun? I love that top! It's so adorable with the stripes into a V and bow tie shoulders! aye yay yay this is so cute! I love that striped top, it seems like stripes is the thing of the day today! Cute look! The tank is especially fun. So precious! Love it all. 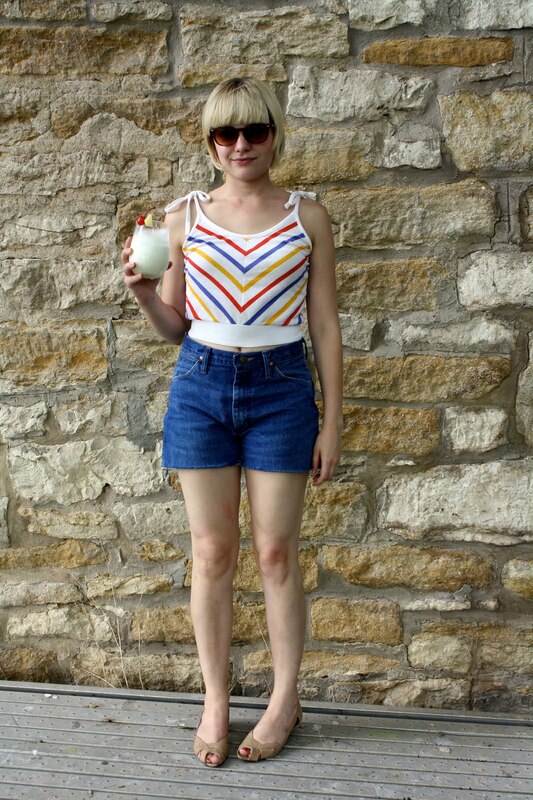 If you can find someone who'll sew for you, there are loads of great new high-waisted shorts patterns out now. Oh how summery you look! I know your feelings on denim shorts. I've never been able to find a pair that I've truly loved. Mmmm, pina coladas! I love them. I wish I could hop in that picture & take a sip of the one your holding! Adorable outfit! You should post a how-to on your pina coladas!